I found this recipe while flipping through one of my old Texas cookbooks. I’d skipped over it many times before, but I was in the mood to make a white cake and “Sam Houston White Cake” seemed like a fun project. Plus I was taken with the name, because in my past life as a Texas Capitol tour guide I spent a lot of time talking about Sam Houston. Little did I know he had a favorite cake! Once I settled on the recipe, I did a little more research and found that Sam Houston White Cake has a place in advertising history. Imperial Sugar used to print the recipe on the back of their boxes, and they even used it in one of their old TV commercials. If you don’t have time to bake the cake, at least watch this commercial. After reading all about the cake(and watching the commercial 100 times or so), I finally made it and was happy with the results. It’s soft, light, just a little bit crumbly and has a distinct flavor thanks to the mix of almond extract and vanilla. 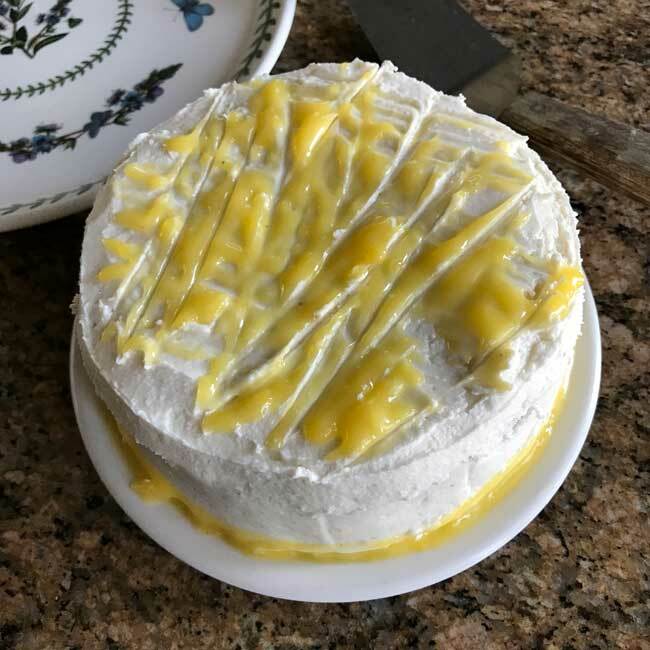 You can pair Sam Houston White Cake with a chocolate frosting, but if you are anxious to use those leftover egg yolks you might make a quick batch of lemon curd for the filling, then frost with a basic white icing. I made both flavors (our freezer is about to explode with cake, so I made the second version as a small cake) and liked the chocolate version best. I typed up the recipe the way I made it, but you can also find it on the Imperial Sugar web site. 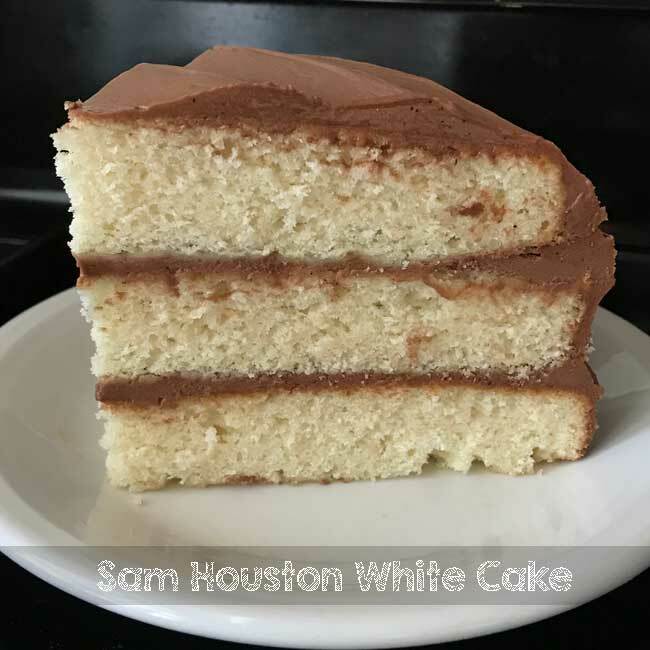 Sam Houston White Cake is a three layer cake made with almond and vanilla extract. It can be filled with lemon curd and frosted with vanilla icing or frosted and filled with chocolate icing. For a small cake, make 1/3 of the recipe and divide between two 6 inch round cake pans. Preheat oven to 350 degrees F. Grease and flour three 9x2 inch round baking pans. In a mixing bowl, using an electric mixer, beat the butter and sugar until light and creamy. Beat in the extract. Combine the milk and the water, then add the milk mixture and flour alternately in three parts, stirring by hand until flour is well blended. With an electric mixer, beat the egg whites until stiff peaks just start to form, then fold them into the batter. It will be fairly thick. .
Divide batter among the pans and bake for 25-28 minutes or until cakes spring back when touched. Let cool in pans for 10 minutes, then carefully invert onto rack and let cool completely. Frosting: MAKE SURE ALL INGREDIENTS ARE AT WARM ROOM TEMP. Using cold milk or cool butter sometimes causes the chocolate to lump up in little bits. Beat together softened butter and cocoa powder. Stir in about half the sugar and both of the melted chocolates. Gradually added remaining powdered sugar, stirring or beating on low speed. Increase speed of mixer and continue beating and scraping sides of bowl, adding milk and vanilla. Cook's Illustrated Fluffy Yellow Cake -- Best Yet! Loved the commercial! I copied recipe so I can make this beautiful cake soon! Thank you! Loved the commercial! 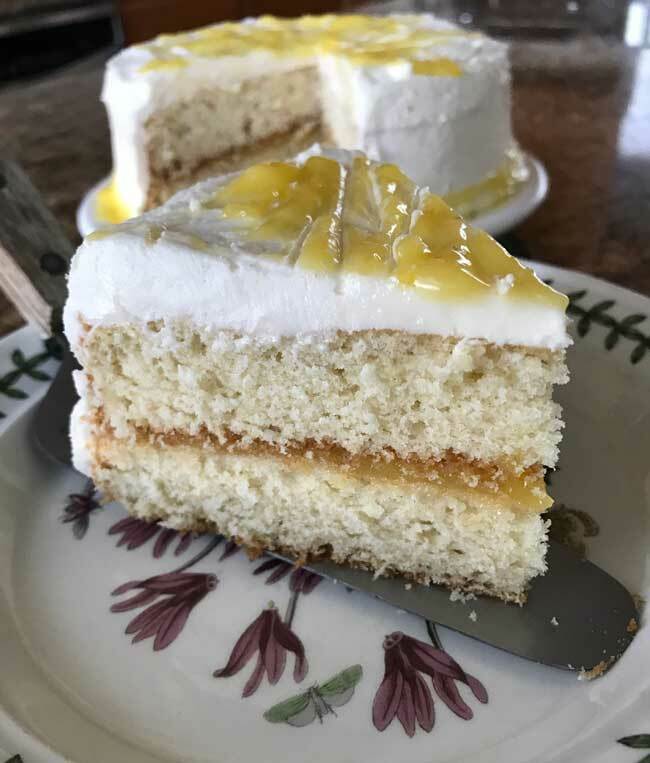 No need for white cake right now at our house but both my mother in law and sister in law like white cake so sometime I hope to make this for them.